The 2018 MotoGP season has just ended with Marc Marquez (Honda) crowned champion, yet again, but the riders are already back at work testing their 2019 machines. 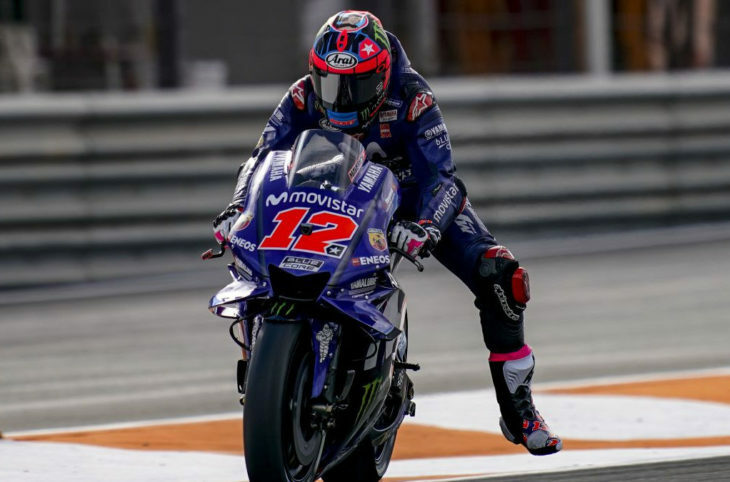 The two-day test at Valencia has just ended with Yamaha’s Maverick Viñales (sporting his new number 12 on his bike) posting the quickest lap time. The test saw several riders switch to their 2019 bikes, such as Jorge Lorenzo on a Honda and Johann Zarco on a KTM. All the rookies participated, as well, and the new Petronas Yamaha SRT satellite team was on track … with the young Franco Morbidelli apparently enjoying his new Yamaha after posting the 6th quickest time. Jorge Lorenzo, on an unfamiliar Honda and with a still sore wrist, looked pretty good for his initial outing. He posted the 12th quickest time (out of 25 riders), less than a second off of Viñales and roughly 6/10ths of a second behind new teammate Marquez. Another two-day test is scheduled at Jerez next week. In the meantime, take a look here for the combined times from Valencia. Uh, I’m sure it is. Important that is. As in folks, post is reported, but don’t click that link in the meantime (just in case your coffee hasn’t kicked in yet). I swear I’m not nuts. There was a spam post. I swear. My comment/reply to it has been promoted to its own post in its absence. It’s become the Marquez/Dovi show for the past year. Let’s hope that Lorenzo, and some others get into it. Marquez is quite the alien. The bike does not just win on its own as we have seen from other riders on it. Stoner won on the Honda. I’d like to see some of the other DUC riders keep hounding the guys at the front and Rins on the Zook as well. Was it last year or the year before Vinales set the world on fire in testing and was pronounced the next coming? Even won the first race or two, then HEELLLlllllooow? Where did Vinales go? If I recall the gossip, Michelin changing the design of the front tires mid-season started his trouble in 2017. Up until that point, people were sounding as if they were expecting him to win the title that year. I hope he does have a great 2019 season, along with Marquez, Lorenzo, Rossi, and the rest of the front-runners. I want to see some great races. He was blitzing the field for two races and then it was reported because of HRC’s complaints Michelin changed the tires. Yamaha then had handling problems and well the rest is history. So yes he did .